Nothing is more wonderful than the art of being free, but nothing is harder to learn how to use than freedom. Making a difference. Leaving a legacy. Moving from success to significance. Few recurring themes in modern Western society are more powerful than the contemporary search for purpose and fulfillment. Our primary trouble is that, as modern people, we have too much to live with and too little to live for. Most of us in fact live, in the midst of material plenty, in spiritual poverty. This curriculum explores this powerful human desire for purpose and significance. 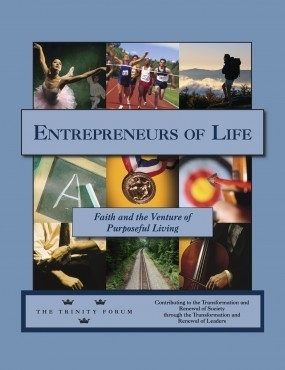 In the process, the readings examine the opportunities, challenges, and seasons of life that provide the backdrop of our individual life journeys in this world. At once inspiring and incisive, Entrepreneurs of Life will challenge each of us in setting our priorities and assessing our progress. Part One of the readings introduces the Jewish and Christian view of purpose through calling, which can provide the “ultimate why” for human motivation. This view is contrasted with its two most powerful rivals in history—the Eastern answer and the Western secularist answer. Part Two examines the lives of two great heroes who demonstrate how individuals can truly make a difference and change their times. The lives of both William Wilberforce and Aleksandr Solzhenitsyn are examined in this section. Part Three explores some of the tests and trials of living life as an entrepreneurial calling, as a conflict-filled quest. Included are such stirring stories as Beethoven battling with deafness and Magellan succumbing to hubris after his epic round-the-world journey. Part Four begins with Tolstoy’s much-loved story of “Two Old Men,” which brings us to appraise our character and priorities in life. Part Five raises the issue of “finishing well” in life’s journey. For followers of the call, life is an entrepreneurial venture to the end and the challenge is plain: to finish strong and well. When No One Sees offers a series of readings that help us explore, in very practical ways for each level of society, the issues that surround character—the reality of the core of our being, who and what we are when no one else sees. Few issues in our time are more important for individuals and society; few Christian contributions are more decisive and timely; few subjects are more searching for each one of us. In the opening session, we trace ideas about the substance and nature of character throughout Western history—from Plato and Aristotle to the present—focusing on the reasons character is an essential ingredient of good leadership and a just society. In the second session we examine the role of personal crises as tests of character, both in terms of refining and revealing it. 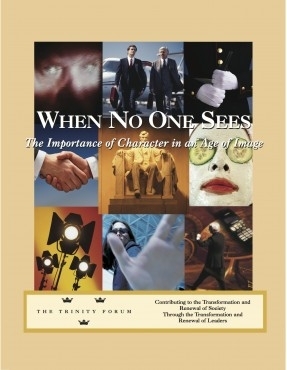 The third session analyzes current cultural conditions that daily shape our lives and threaten to erode our character. Session Four turns to spiritual concepts, habits of mind and action, that have proven to be revolutionary and practical antidotes to the widespread modern erosion of character. In the final session, we examine the lives of various heroes of character whose example can help us envision and model excellence and integrity in our personal and public life. The readings in this curriculum reintroduce the seven deadly sins (pride, envy, anger, sloth, avarice, lust, and gluttony) and contrast them with their opposites, the beatitudes of Jesus. Using sources ranging from the Bible and Aristotle to the New York Times, the texts raise questions about the consequences of the deadly sins for a generation that has come to minimize any notion of sin. The vices and virtues, they suggest, offer us a true moral compass by which we can steer through the chaos of modern society. The goal of the readings is to help us recover a more realistic view of the human inclination to evil—both as individuals and in societies—which is the urgent precursor to the necessity and wonder of redemption. The Journey: Our Quest for Faith and Meaning As the seasons of our individual lives intersect with the mounting problems in Western societies, many leaders are approaching the wisdom of Socrates—“An unexamined life is not worth living”—with new seriousness. 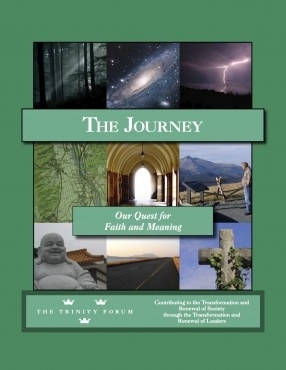 The Journey offers a series of readings that chart a thinking person’s road to faith. It has been prepared for two kinds of people—those who do not view themselves as people of faith, but who are serious about the big questions on the journey of life; and those who are at some stage along the journey of faith, but have not had occasion to reflect deeply on why they believe what they believe. The four units of this curriculum are based on four stages that are integral to the quest for spiritual meaning—and therefore to a thinking person’s journey toward faith. The first stage of the journey is when we become aware of a sense of questioning or need that forces us to consider where we are in life. The second stage is when we actively seek answers to the specific questions and crises raised at the first stage—and are drawn toward the one we believe is the answer. The third stage begins when we ask whether the answer we found at the second stage is in fact true. The fourth stage is when we begin to reach conclusions that culminate in a step of commitment. It might be said that never in the entire field of human need has so much been asked so often of so few. 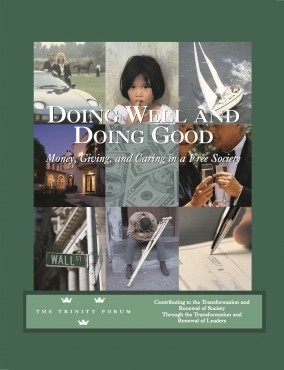 And at a time when more and more is being asked of the willing volunteer and the generous giver, public debate is strong on the nuts and bolts of philanthropy—especially taxes and laws—but weak on this unique Western tradition’s roots and great ideals, especially the decisive contribution of faith. The readings in Doing Well and Doing Good are rich in insight and application and help us explore the questions that surround giving today. What is the meaning of money? Of giving? Of voluntary associations? Of doing well and doing good? What are the most effective ways of giving that are not damaging to one’s heirs and cannot be sidetracked by foundation professionals after one’s death? The readings address these and similar topics. The curriculum also touches on many of the big questions in public life today—government downsizing, the renewal of voluntarism in a free society, the importance of “social capital” and “social entrepreneurialism,” and so on. Doing Well and Doing Good is designed for those thinking through the issues of giving in their own lives as well as for those wishing to contribute constructively to today’s great debates on the issue. Can human beings establish good government simply through reflection and choice? Can a free people govern itself? Can a self-governing people sustain its freedom? These questions, central to the thoughts of the framers of the American republic, are now somewhat unfashionable. But the framers knew that they were embarking on an experiment that would not sustain itself. They saw that the greatest danger the republic would face would be its own success. Additionally, they would be surprised at the current perception of religion in public life as irrational, reactionary, divisive to society, and best quarantined from public life. The framers clearly gave as their best advice for sustaining liberty the maintenance of a socially constructive religion among the citizens. If they are correct, it is freedom itself at stake. This curriculum is written, first, for all who seek to understand the genius of the American experiment and the framers’ understanding of how it may be sustained. Second, it is for all who have an interest in the continuing vitality of American leadership in the world, including citizens of other countries who realize that the experience of the world’s “first new nation” has lessons, for better or for worse, for all the nations of the modern world. Third, it is for everyone who wants to address the role of faith in public life—who wants to know how we can live with our deepest differences. 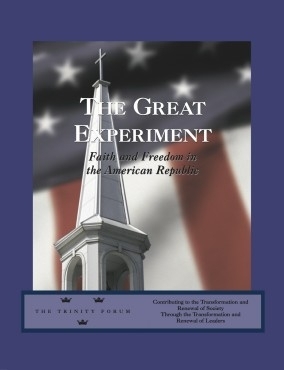 The Great Experiment provides a series of readings through which we can explore these issues, looking at the experiences of the first immigrants (winning freedom), the historical and intellectual roots of the Constitution (ordering freedom), the results of the experiment, and the challenges for the current generation (sustaining freedom).